Farmweld is committed to the protection of your personal information in accordance with the National Privacy Principles set out in the Privacy Act 1988 (Cth). In general, you can view the Farmweld website anonymously. However, there are times Farmweld may seek and collect information from you, for example when you contact us for information or a quote. “Personal information” is any information (recorded in any form) about a person, whether true or not, from which that person may be identified. Farmweld collects personal information from its users when you email us or contact us by telephone or mail. When and how is information collected? Farmweld will not collect any personal information about visitors to the Website except when they knowingly provide it or as otherwise described below. For example, we will collect personal information from users to the Website when you enquire about products or request information from us. When you visit and browse the Website, our service provider records visits and logs the following information for statistical purposes – the user’s server address, the user’s top level domain name (eg. .com, .gov, .au, .uk etc. ), the date and time of the visit to the site, the pages accessed and documents downloaded and the type of browser used. No attempt will be made to identify users or their browsing activities except, in the unlikely event of an investigation, where a law enforcement agency may exercise a warrant to inspect the service provider’s logs. Yes. Cookies are small text files that are transferred to a user’s computer hard drive by a web browser (if your settings allow) for the purpose of storing and or recording information about a user’s ISP, browser type or website visiting patterns. If you access the Website, a cookie may be downloaded onto your computer’s hard drive. ‘contact information’. This may include an email address so Farmweld can contact you. It may also include your name, mobile phone number, other phone numbers and address details. Your email address is recorded when you send us a message. It will only be used for the purpose for which you have provided it and should it ever be added to a mailing list, you will be given the opportunity to ‘opt out’ from further communication. Communications (by email or other means, which pass through the Farmweld systems) between yourself and Farmweld. Other personal information provided voluntarily by you. This could be in response to information required to provide you with a quote or information requested by you. How does Farmweld use the personal information it collects about me? Direct marketing in relation to promotional activities where it is impracticable for Farmweld to obtain your prior written consent. Who does Farmweld disclose my personal information to? Farmweld does not disclose your information to any other third party. Farmweld may disclose your personal information to its Website host and technology service providers in certain limited circumstances, for example, when the Website experiences a technical problem, to ensure that it operates in an effective and secure manner. Farmweld will not disclose any of your personal information to any other organisation unless the disclosure is required by law or is otherwise permitted by the National Privacy Principles. 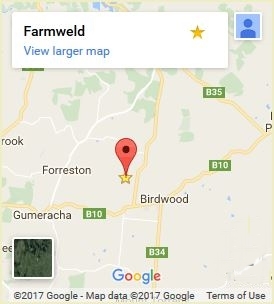 How is personal information held by Farmweld updated, stored and secured? Farmweld aims to keep your personal information secure and up to date. Any personal information that is collected electronically is protected by safeguards including physical, technical (firewalls, SSL encryptions etc) and procedural methods. What can I do if I have a question, problem or complaint about the use of my personal information?